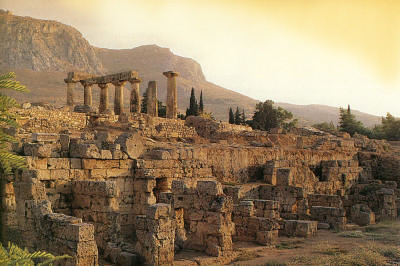 Corinth was inhabited for the first time somewhere around 5000 BC. It was a suitable site for human settlement as there was plenty of water and the terrain was ideal, with the rock of the acrocorinth towering to the south, a natural fortress which soon became the acropolis of the city. Harbours and the Isthmus, the only land bridge connecting the Peloponnese with central Greece, were also close at hand. In prehistoric times, Corinth was one of the richest cities in the Greek world. The first semi-historical king, Aletes, leader of the Dorians arrived here around 1000-900 BC. During the Archaic (750-500 BC) ages the city founded a number of colonies including Corfu and Syracuse, developed into a leading naval power and supported the arts and sciences, reorganizing the Isthmian Games which were held in honour of Poseidon every two years. Later, it became an ally of Sparta and one of the most powerful members of the Peloponnesian League. In 243 BC it joined the Achaean League and emerged as its chief city, but the League was overcome by the Romans in 146 BC who looted and devastated Corinth. It was not until a century later that its reconstruction was ordered by Julius Caesar and further endowed with fine buildings by Hadrian and Herodes Atticus. The remains of ancient Corinth as laid out by Julius Caesar in 44 BC lie not far from the modern city, a quaint town with whitewashed houses and little gardens blooming with flowers. The archaeological site contains the Roman Forum built in the same position as the ancient Agora. At the west entrance to the site, built on a podium is Temple E of the 1st Century AD, dedicated to Octavia, sister of Octavian. The site includes shops flanking a north south axis road, numerous Roman temples, a Roman Odeum and theatre. The seven surviving Doric columns of the temple of Apollo, stadium and Asclepium—sanctuary of the healer god Asclepius—date to Greek Classical times. The temple of Apollo, built in 540 BC, is one of the earliest yet most characteristic Doric temples in Greece with unusually heavy and elongated proportions. The famous Peirene fountain was also built in Classical times. Herodes Atticus rebuilt it in the 2nd Century AD making it even more elaborate. The new fountain had two storeys and was richly decorated with recesses, statues and wall paintings in its time. The museum at the site contains important finds from ancient Corinth. On display are Corinthian pottery produced in the Archaic period, black figure ware, Archaic funerary sphinxes, torso of a kore dating to the 5th Century BC, and vases of the Classical period. Corinthian pottery differs from its Athenian counterpart in that the former was worked on alabaster and had painted ornamentation whilst the latter was unpainted and made of a clay mixture. Also on display are sculptures of Roman emperors and their families, and Roman mosaics with mythical themes, plant motifs and landscape scenes. In a separate room are the finds from the Asclepium consisting of terra cotta replicas of cured body parts offered to the sanctuary by grateful patients. The whole site is imbued with profound peace and calm. Silent ruins stand watching as the birds in the trees chirp away. Green blades of grass sway in the wind, embellished with a million spring flowers. The name Mycenae is associated with the most important Greek myths that have come down to us through the epics of Homer and the great tragedies of antiquity. According to legend, Mycenae was founded by Perseus, son of Zeus and Danae, and his descendants ruled in the area for many generations. The Perseid clan was succeeded by the dynasty of the Atreids, founded by Atreus. The son of Atreus was Agamemnon, proud leader of the Achaeans (ancient name for the Greeks) during the war against Troy in the 13th Century BC. On his return to Mycenae, after the victorious conclusion to the Trojan war, Agamemnon was murdered by his wife Clytemnestra and her lover. His son and daughter, Orestes and Electra, thereafter killed them both in their quest to avenge the death of their father. The mythological background to the history of Mycenae has been supported by excavations carried out by the Greek Archaeological Association and Heinrich Schliemann in 1876, amongst others. Separated from the surrounding slopes by steep gorges, the hill of Mycenae is 278 meters high. Human habitation dates to neolithic times but it was during 1600-1200 BC that Mycenae gained in power and prestige, ultimately giving its name to an entire historical period. In the centuries of its greatest power, Mycenae was the centre of the Mycenaean civilization. And then around 1200 BC the city was completely destroyed. Their vigorous and splendid civilization came to an abrupt end under the successive onslaught of invasions by less civilized Greeks called Dorians from the north. The Mycenaean civilization was a development of yet an older world, the brilliant Minoan civilization which dominated the Aegean and was centred on the island of Crete from 2000-1400 BC. 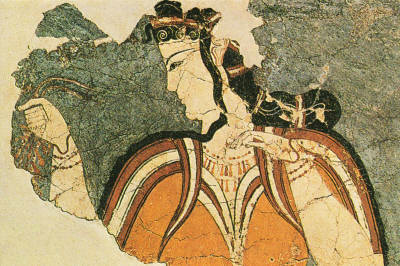 The Minoans were a lively, pleasure loving and sensuous people. They were fond of bright colours, intricate games and elegant clothes. Their homes, sometimes five storeys high, had light wells and setback terraces, whilst their palaces contained a sophisticated system of plumbing and flush toilets. Some of their engineering skills, if not all their cultural refinements were taken over by the Mycenaeans. Decisions of a Mycenaean king and his court were carried out by an officialdom consisting, in diminishing order, of military leaders, administrative officials, charioteers and mayors of the group of villages that surrounded the city. Actual records kept by the efficient bureaucracy of tax assessments, land holdings, agricultural stores and inventories have been discovered. These records, written on clay tablets in Linear B script and only recently deciphered, also list more than 100 Mycenaean occupations. In sum, they were an accomplished and enterprising people. However, a principal Mycenaean business seems to have been war. The Mycenaeans were spectacular builders as well. Their palaces were built within formidable citadels, and some of their royal tombs known as tholos were enormous beehive structures made of stone weighing sometimes as much as 120 tons. They were also immensely wealthy, especially in metals and most specifically in gold. 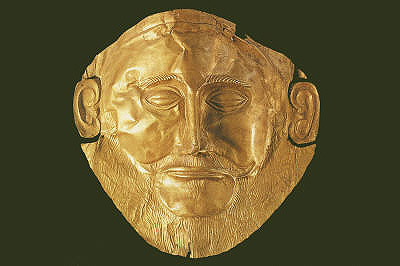 In Mycenaean tombs archaeologists have found death masks and breastplates of gold, bronze swords and daggers, gold and silver drinking cups, gold rings and diadems, and thin sheets of gold used as funeral wrappings for the bodies of two small royal children. The tombs have disclosed something of the physical characteristics of the people too. They were tall and broad faced; the men were moustached and sometimes bearded. The city of Mycenae stood on an acropolis surrounded by walls standing as much as 12 meters high and made of huge undressed boulders. The acropolis was first fortified in 1350 BC. The walls were later extended in 1250 BC to enclose Grave Circle A. The Lion Gate, a double door gate on the north west side of the acropolis, also dating to 1250 BC, is to be seen today in its original form. The step, gateposts and lintel (weighing 18 tons) are all single blocks of stone. There is a relieving triangle above the gate with a slab of grey limestone in it. On the slab are depicted two lions facing each other with two joined altars and a Minoan pillar. The relief has been interpreted in numerous ways: as purely ornamental, as the emblem of the kings of Mycenae, as a sacred symbol, or as evidence of the link between Mycenae and Minoan Crete. Whatever its meaning, it is a beautiful work of art combining symmetry of form with the fierceness in the depiction of the lions. To the right of the courtyard is the granary, so called because of the storage jars of wheat which were found here. Further to the south is Grave Circle A which was discovered by Schliemann. Its 19 occupants, all royal and dating to the mid-16th Century BC, had been buried with gold artefacts weighing a total of 14 kilograms. These artefacts are now on display at the Archaeological Museum in Athens. The Grave Circle comprises a double ring of slabs. The Mycenaeans seem to have taken particular care to protect the tombs of their former leaders which they enclosed in a wall. A total of six shaft graves consisting of simple pits were dug into the rock and covered by heaps of soil on which stone funerary stelae with low relief carvings of hunting, battle and chariot racing scenes were then erected. Similar scenes were also used to decorate the walls of the palace which is approached by a paved ramp. The central court of the palace had three rooms: the porch, vestibule and hall. In the centre of the hall are some parts of a circular hearth surrounded by four columns. The king’s throne would have stood in this room. Outside the fortified complex is Grave Circle B and various houses. Among the finds from the latter were approximately 65 clay tablets with inscriptions in Linear B script. 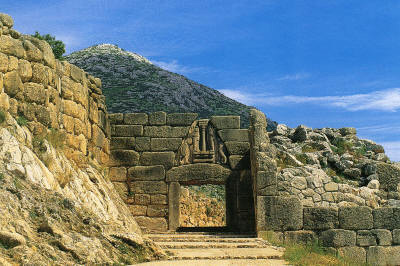 In the general area around Mycenae are many chamber and tholos tombs. The tholos tombs are magnificent and characteristic examples of Mycenaean funerary architecture. The Treasury of Atreus is the best preserved prehistoric funerary monument in Europe, and the most advanced of the tholos tombs. The burial chamber is reached along the dromos, a corridor whose walls are faced with carefully dressed stones. The facade of the tomb was originally decorated with half columns and linear motifs in green steatite. The lintel consists of two huge slabs of stone, above which is the relieving triangle, essential for the protection of the structure. Inside, the tomb is in the shape of a beehive, with 33 layers of stone sloping gradually inwards and locked with a keystone. The inside length and width are the same but the ceiling gives an impression of being much higher; the stones of the concentric rings become smaller on their way up heightening the illusion of depth and distance. The interior must have been decorated in ancient times as evidenced by the presence of nails. Another door also with a relieving triangle, leads into a side chamber. The name of the tomb which dates from around 1250 BC comes from the belief that Atreus himself had been buried in it. I had a gorgeous time in Mycenae. Climbing up the precarious hill to the palace, walking amongst the ruins, golden in the mid-afternoon sun, laughing and joking with fellow explorers. It was wonderful. 3,500-year-old moments of history and mythology embraced in exaltation. This entry was posted in Exploring our World, Greece and tagged Ancient Corinth, Classical Greece, Corinth Canal, Greek Mythology, Heinrich Schliemann, Mask of Agamemnon, Minoan Civilization, Mycenaean Civilization, Things to see in Greece, Tojan War by Rama Arya. Bookmark the permalink.